I found this note in my car, but do not know how it got there or who Andre might be. My only guess on how it got in my car is that one of my friends found it and put it there thinking I would get a kick out of it. My wild guess about the origin of the note is that there are several summer camps in the area and Andre might have been a camper that lost his tooth while away from home at summer camp. 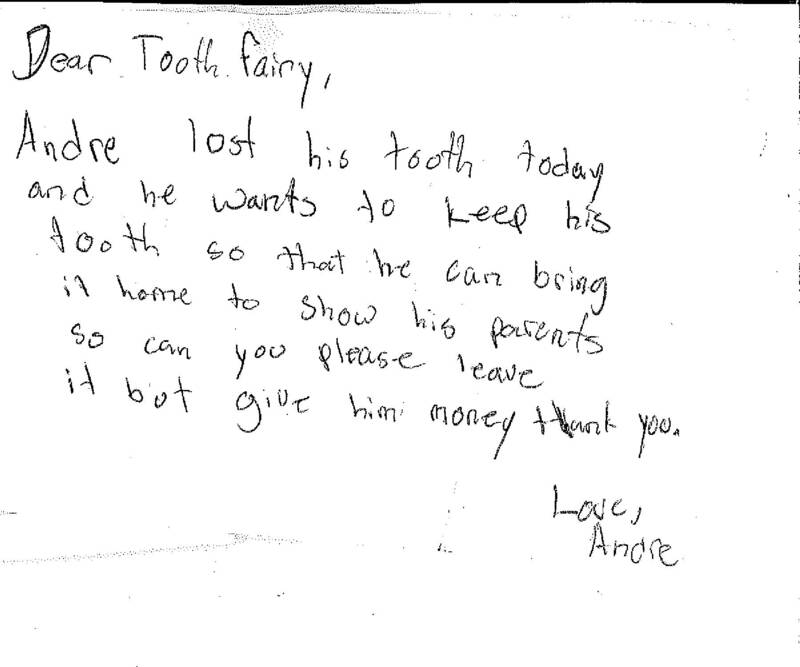 Believing in the omnipotent power of the tooth fairy, Andre left the note, presumably without the tooth, to get his money upfront. But perhaps Andre didn’t think the tooth fairy was too omnipotent because it also appears that he may have thought he could trick the tooth fairy into paying up again once he got home? Either way his spirits were probably dashed in the morning when he found no money, and there was evidence that the note had obviously been crumbled into a ball and tossed. I love this find because it leaves you wondering if this story ended with Andre’s faith in the tooth fairy shaken or not.